We can evaluate the quality of a queen honey bee by observing the colony over time. By simply observing the colony for several traits we can learn much about the queen. However, it is important to know if we are continually observing the same queen rather than another one that has superseded the original queen. A queen bee can live for several years, but some colonies replace their queen quite frequently. To keep track of the particular queen in a hive it is convenient to paint a colored marking on her thorax. If the queen is found again, her colored marking will identify her. If a queen is found without a marking, it can be assumed that this is a new queen that the colony has produced. A simple color code rotates every five years and indicates the queen’s age. This past year I found my longest-lived queen; she was four years old. I was delighted to find a queen that had survived for so long. It was especially useful to propagate her genes by grafting her larvae and allowing her drones to mate with other queens. 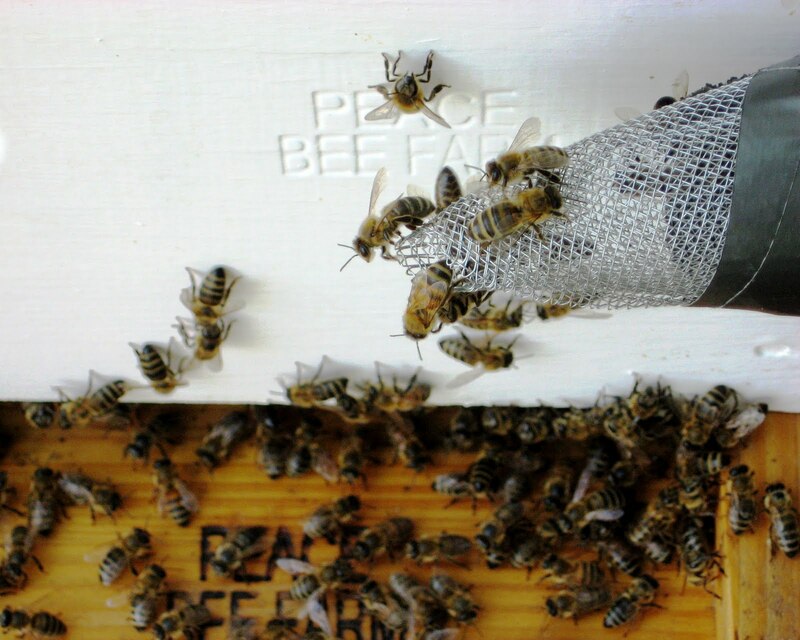 Increasing queen bee longevity is one of the goals of Peace Bee Farm’s queen raising program. In today’s photo Mary Phillips is marking a queen bee in the queen mating bee yard using a plastic tube covered with a plastic mesh. Mary gently holds the queen against the mesh and applies a dot of colored paint to the bee’s thorax. We mark the young queens in the mating nucleus hives after they have completed their mating flights and have begun to lay eggs. We don’t handle the queens until they are laying eggs, because they occasionally fly away. Once the queen bees are laying eggs, they are ready for the beekeeper to begin evaluating their performance. If they survive through the next winter, they may be selected to produce new queens. Honey bees usually reproduce their colonies in the spring of the year by division. 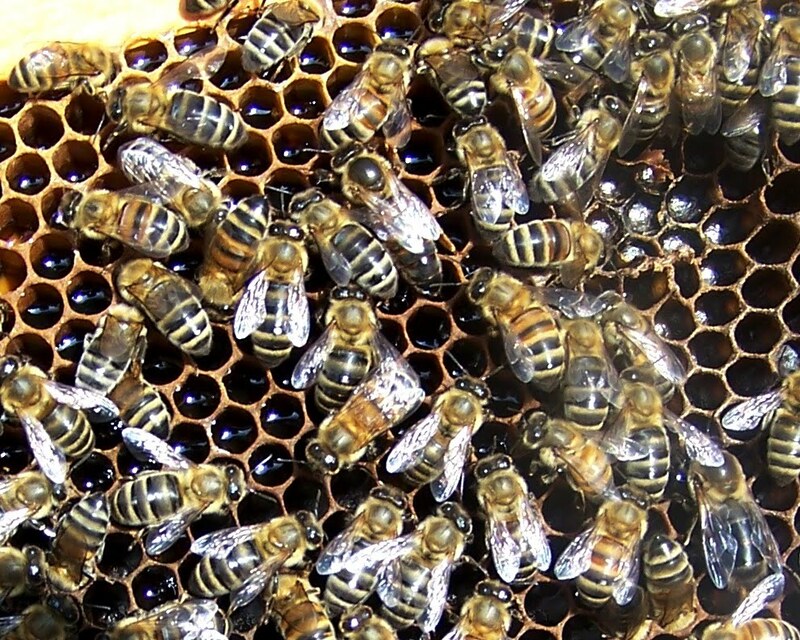 As a part of the preparations for dividing the colony, the bees produce new queens. In keeping with the honey bee’s natural tendency to readily produce queens in the spring, beekeepers find that they have the greatest success in raising queens at this time. This is also the time to replace colonies that died over the winter and to increase the number of colonies if more are wanted for honey production or pollination service. To produce the new queens, very young larvae are removed from the colonies having the best traits and grafted into artificial queen cell cups. These grafted larvae are placed into hives specially set up in a manner similar to colonies preparing to swarm. The worker bees feed the larvae a diet of royal jelly, an enriched food that causes them to develop into a queen rather than a worker. The queens develop in beeswax cells that the workers build around the artificial queen cell cups. The queen cells are the size, shape, color, and texture of a Virginia peanut. Queen bees emerge as adults after 16 days, but they don’t begin laying eggs for about two weeks. During this time they make a series of mating flights and their reproductive system continues to develop. Click on the photo to can see a young queen that has not yet begun to lay eggs. She is the bee in the center of the picture with the black-colored thorax. Her abdomen is a little longer than those of the worker bees. To produce a good queen, we need to graft a larva from a colony with desired genetic traits; she must make an effective series of mating flights and mate with high-quality drones; and she must be fed a nutritious diet. To ensure good nutrition, her queen mating nucleus hive must have plenty of young worker bees to produce royal jelly and feed the queen. When the young shoots are picked fresh from the home garden, asparagus is a spring-time treat. Shoots which rise daily from underground tubers are picked daily for a short period. After a few weeks of eating the vegetable shoots cooked with butter and raw in salads, the asparagus plants are left to grow into lacy four-foot tall plants. It is important to stop harvesting the shoots to allow the plants to strengthen the tubers through photosynthesis. 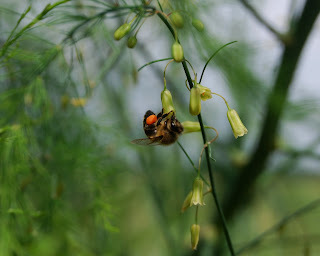 The asparagus plants will also produce tiny bell-shaped flowers that are quite attractive to honey bees. If you click on the photo, you can see how the honey bees have to learn to hang under the pale yellow-green flowers to access the pollen inside. This forager’s pollen baskets are loaded with bright orange asparagus pollen. When the bees carry pollen from plant to plant, they pollinate the plant, and small red berries are produced. The berries are eaten by song birds which distribute the seeds. When I find the lacy asparagus plants growing around the farm, I dig up the tubers, or crowns, and move them to raised, mulch-filled planting beds. Asparagus feeds heavily, and it takes about three years for the roots to mature to the point of being able to support a modest harvest of shoots. By the time that I find a plant, the tuber is quite well developed. I have located the lacy foliage of an asparagus plant growing next to an old disk harrow. I’ll move the crown next winter and harvest some shoots in the spring. There is an interesting relationship between the pollination of this vegetable by honey bees, its serving as a food for wildlife, its distribution by songbirds, and its use by humans for food. Asparagus is perennial plant in the lily family, related to onions and garlic. I consider it a delicacy, and I thank the honey bees for helping to propagate it. They are only concerned with collecting the nectar and pollen. Honey bee nutrition has been identified as an important element in bee colony health. Weather conditions, such as droughts, have brought about failures of nectar and pollen plants important as food sources for honey bees. These conditions have been observed in areas affected by Colony Collapse Disorder, and they are considered as stressors on the bees. Fortunately, we are not experiencing adverse conditions here in the Arkansas Delta which would affect nectar and pollen availability. There is an abundance of diverse plants in bloom. Having a diversity of bee plants insures that the brood will have all of the nutrients necessary for complete development. Complete nutrition, along with good genetics and successful mating, is especially important for producing high-quality queens. To develop a reproductive system capable of producing a large population in the bee colony, the queen must have good nutrition throughout her development as a larva and pupa into an adult bee as well as during the days before and after her mating flights. If you click on today’s photo, you can see worker bees preparing bee bread to be fed to the colony’s brood. The bee bread is the substance in the cells with a wet appearance. It is composed of pollen mixed with honey. Together, this is a complete food. The honey provides carbohydrate; the pollen provides protein, fats, vitamins, and minerals. From the various colors shown in the picture, we can see that the bees gathered pollen from a number of floral sources. Having a diversity of flowering plants ensures that the bees’ food will contain all necessary amino acids from the proteins in the pollen. The dark, wet cells contain honey. Some fermentation occurs in the bee bread, and this helps preserve the food. This pollen-laden frame was located immediately adjacent to the brood nest; honey bees store their pollen close to the brood. Outside the frame of pollen were frames of spring-time honey. As brood production continues, these stores will be rapidly consumed. Honey bees are tireless workers. Anytime that there is nectar available and flying conditions permit, foragers are out collecting. The guard bees at the hive entrance welcome any bee entering with nectar, even if it is a forager drifting into the wrong hive. Once the nectar is inside the hive, it is stored in combs, even if there is not available normal storage space. Inside the bee hive, we normally find the brood nest in the lower, center portion of the cavity. The brood, which consists of the eggs the queen laid as well as developing larvae and pupae, is surrounded by a narrow layer of pollen and a layer of honey. Larger honey storage areas for the colony’s winter food stores usually exist above the brood nest. The queen moves about the brood nest laying eggs in continuous patterns of cells as the workers clean and prepare the brood nest. The workers emerge after 21 days from the time the eggs are laid. The emergence of the adult bees frees the cells for the queen to lay more eggs. However, if flowers come into bloom in abundance, worker bees will store the nectar in the brood nest cells. The bees convert the nectar into honey, and the crowded hive may be described as being honey-bound. The loss of egg-laying capacity is one of the great stimulators for the colony to swarm. It is important for the beekeeper to take corrective action to prevent a honey-bound colony from swarming. 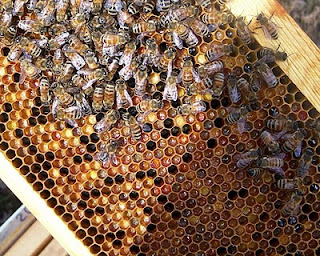 Frames of honey can be removed from the brood nest and replaced with empty drawn comb or frames of foundation. The removed honey can be extracted, or the frames can be moved to a honey super if the same size boxes are used. The honey can also be used to boost a weak colony. 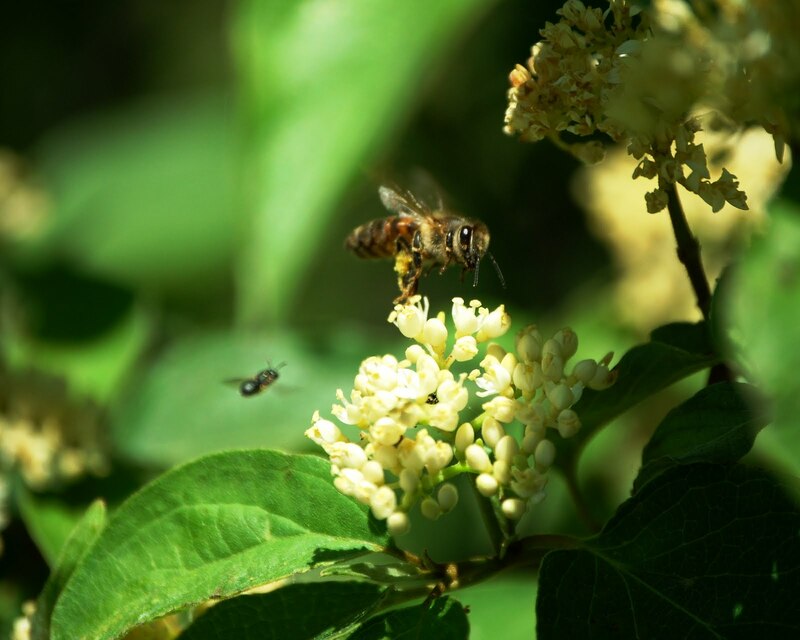 Click on today’s photo of a honey bee and a solitary bee foraging for nectar from the small, exposed flowers of the native tree, alternate leaf dogwood. When honey bees swarm, they regularly move into houses and buildings and build a nest in an empty cavity between the inner and outer walls. These spaces provide an opening very similar to the honey bee’s natural home in a rock crevice or a hollow tree. The colony that I removed from a concrete office building was housed as if in a rock cave; the colony that I removed from a woodworking shop in a cypress garage filled a wall cavity similar to a hollow tree. When the conditions are suitable and time is not an issue, a beekeeper can use a screen funnel method to transfer feral honey bees from a structure such as hollow tree or a building to a bee hive. This procedure works exceptionally well in the spring. The first step in moving the bees out of a structure is to close all of its entrances except one. This can be done by stapling screen or any flexible fabric over any extra entrance holes. Next, the beekeeper brings in a weak, but queen-right hive to accept the bees. I like to use a small colony from my mating nucleus bee yard. I set up a hive with a young queen that is starting to lay a good pattern of eggs. This hive is placed close to the feral bees’ hive entrance. To make the colony transfer, you fashion a funnel from screen wire and attach it to cover the feral bees’ entrance. Foraging bees leaving their hive don’t find their way back inside the funnel. Their numbers overwhelm the guard bees of the close-by weak hive, and they enter this hive instead. The transfer of bees will begin immediately, but will take from six to 12 weeks to complete. Eggs laid in the feral nest won’t emerge for three weeks, and these bees won’t fly as foragers for another three weeks. After the feral bees have been transferred, wax moths will clean out the old nest. The weather that we experience today may affect the honey bees today and well into the future. The temperature and rainfall affect the honey bees’ health and food stores as well as the amount of honey they produce and its flavor. The Mid-South broke out of an exceptionally long and cold winter into a quite temperate spring. Spring flowers bloomed later than normal. 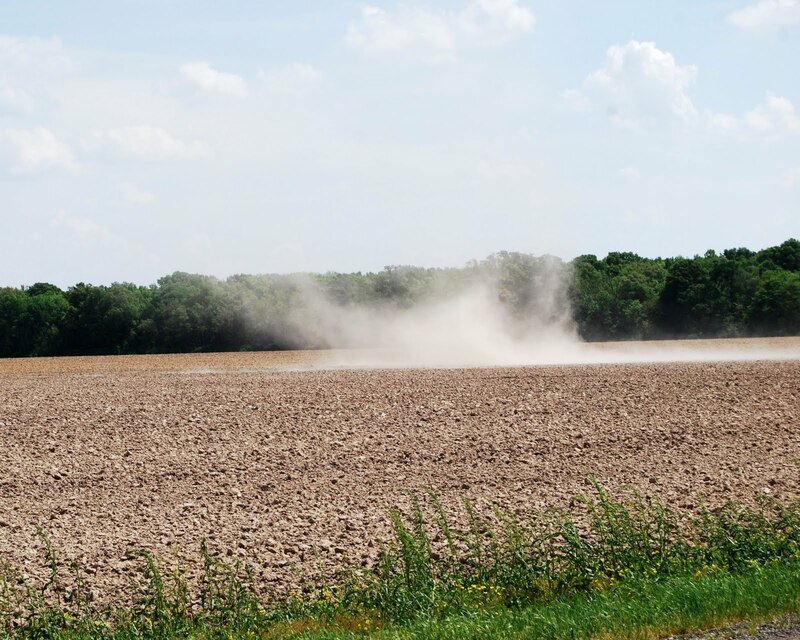 Dry weather allowed area farmers to prepare their fields for spring planting. 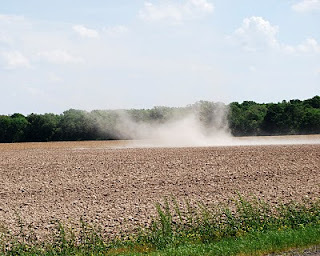 Today’s picture shows a dust devil, a dry vortex of sun-heated air, swirling across a nearby plowed field. The next day, a series of thunderstorms brought heavy rain, large hail, and several tornadoes to the Arkansas Delta. The field, dry and dusty one day, stood under nearly a foot of water the next day. Today’s weather may affect honey bee colonies well into the future. Last year’s ice storm in Northern Arkansas broke the tops out of many nectar-bearing trees. Entire spring-time honey crops were lost along with the nectar normally available for honey bee spring build-up. Slow population growth meant reduced honey harvests in the affected area. Adverse weather in the fall can easily lead to winter losses of colonies due to starvation and disease. Nosema disease increases with long, cold winters; and chalkbrood sometimes flares up in cool spring weather. The weather affects the growth of nectar plants and can change the amount and quality of the honey. Last year’s wet spring brought a strong bloom from privet, a residential hedge which readily escapes into the woods. The privet added a little “bite” to the flavor of spring honeys. As the flowering plants react to the changes in the weather, the effect even shows in how rapidly the honey crystallizes. Honey produced from flowers generally crystallizes faster than honey produced from flowering trees. 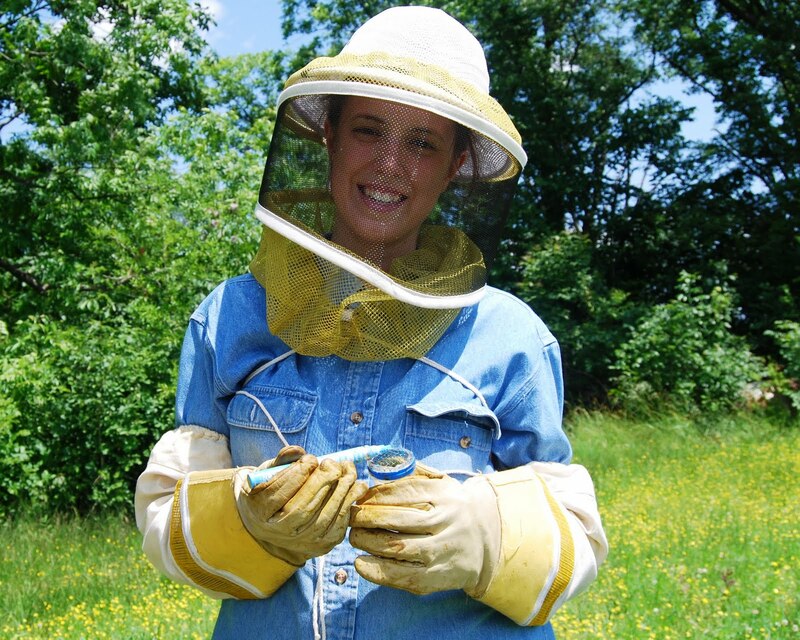 Some beekeepers record weather trends throughout the year to analyze their honey bee health and honey production. Global climate change tends to move the weather toward the extremes. Peace Bee Farm maintains a small bee yard on the grounds of the Hunt-Phelan Home on historic Beale Street in Downtown Memphis. Honey bees foraging the grounds of the anti-bellum home collect pollen and nectar from perennial flowers that have not been cultivated in over a hundred years. I want to thank the staff of the Inn at Hunt-Phelan for sharing some of the home’s rich history: This antebellum home was built by George Wyatt between 1828 and 1832. The home was designed by Robert Mills, the architect of the Washington monument, US Treasury building, and parts of the White House. The original design was a two-story Federalist style home. 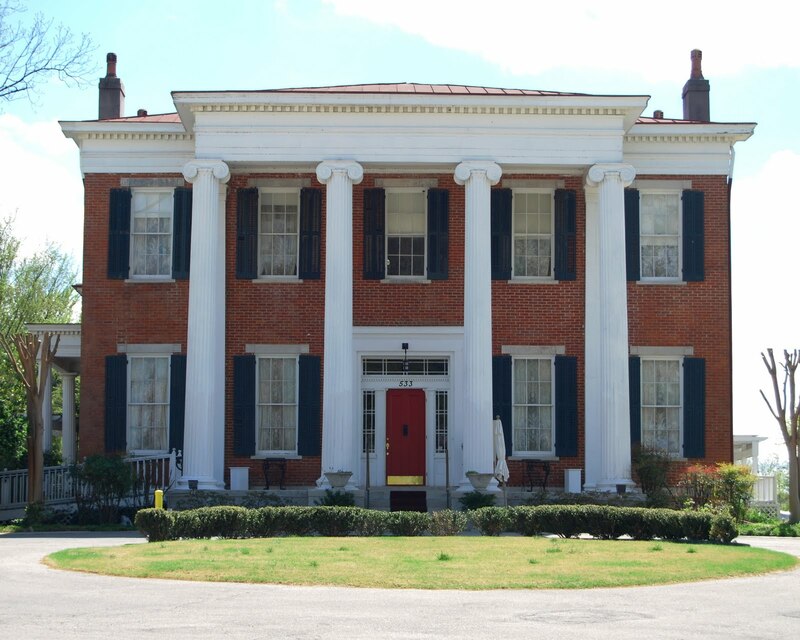 In 1851, a grand two-story Greek revival portico was added facing Beale Street. The home has remained in the same family since it was built. 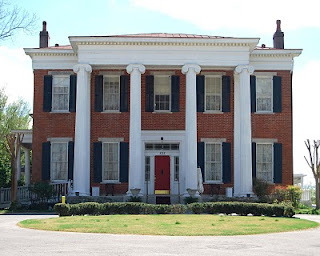 The Hunt-Phelan home has hosted several US presidents including Andrew Jackson, Andrew Johnson, Ulysses S. Grant, Grover Cleveland, and Martin Van Buren. Confederate president Jefferson Davis, a close friend of the family, was a frequent guest in the home. In the early months of the Civil War, the home served as the headquarters of Confederate General Leonidas K. Polk. After the Battle of Shiloh, General Ulysses S. Grant occupied the home as his headquarters. He planned the siege of Vicksburg from the library of the Hunt-Phelan home. Grant respected the home and insisted the Union soldiers remove their shoes when entering. Because of this, the library still has the original floor from 1828. Peace Bee Farm’s bee yard sits behind the home, adjacent to the rubble of a schoolhouse. This was the first school to educate African Americans in Memphis. Following the Civil War, its owner, Colonel William Richardson Hunt, successfully petitioned the US government to have the home returned to him. The home now serves as a small hotel, restaurant, and special events venue. It was an honor to be invited to pollinate the gardens of this historic site. A state-wide meeting of beekeepers found a number of seasoned beekeepers sitting quietly. A beekeeper, new to the craft, commented, “My bees filled a super the first week of May with clear honey. What was the source of the nectar?” In unison six people answered, “Blackberry!” Blackberry is a native vine in the rose family, one of the important families of bee plants. The roses, which also include flowering roses, almonds, cherries, apples, plums, pears, crabapples, and hawthorns, are heavy producers of nectar and pollen. Blackberry secretes an abundance of nectar at the base of the flowers that is highly attractive to honey bees. From this nectar the bees produce a highly valued honey that is clear to amber in color. Blackberries occur along forest clearings and margins. Where there is adequate sunlight, large stands of the vines can be found. However, the availability of blackberry honey from wild plants is not always consistent from year to year. Stands of the plant often decline as forest trees shade the blackberry vines. Blackberries are also cultivated for their delicious fruit which is used to make preserves and fill pies. 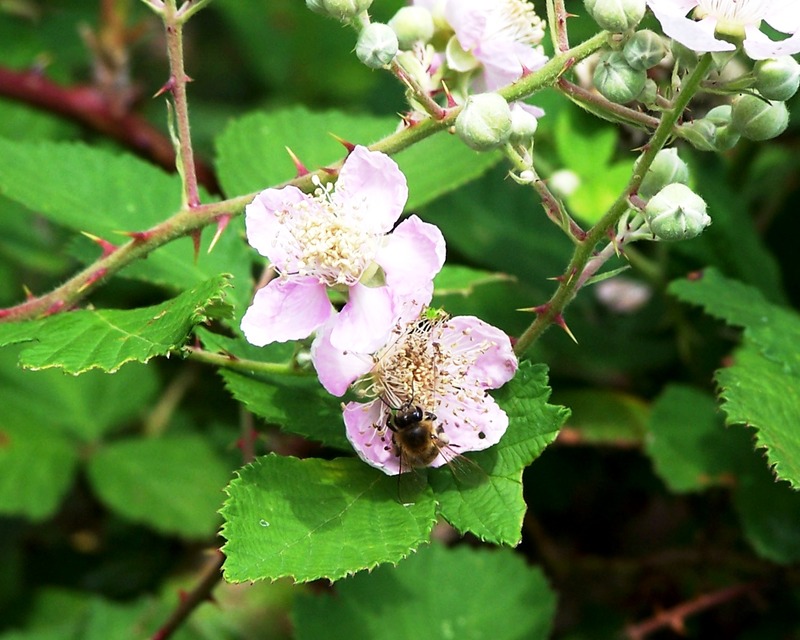 Commercially cultivated plantings of blackberries usually require honey bee hives to be brought into the fields for pollination, as native pollinators are often not available in adequate numbers. If you click on today’s photo, you can see a honey bee foraging for nectar in a blackberry blossom. As the bee moves about the flower, she inadvertently brushes the exposed flower parts with her hairy body. Pollen granules from the flower’s anthers adhere to the hairs on the bee, and she carries them to the sticky stigma of another blackberry flower. Only with this insect pollination will there be fruit produced. The fruit and seed of the blackberry provide enjoyable food for humans as well as important food for wildlife and songbirds. The health of the environment can be measured in part by the abundance of wildlife, songbirds, and pollinators. Agricultural weeds and honey bee pests regularly develop resistance to chemical treatments, especially when the chemicals are used repeatedly. Six authors present diverse views on the increasing problem facing American industrial agriculture as the list of weeds resistant to the most commonly used herbicide increases. Log onto today’s New York Times opinion piece at http://roomfordebate.blogs.nytimes.com/2010/05/06/invasion-of-the-superweeds/ to read these authors’ thoughts on the causes of ten species of weeds evolving a resistance to Glyphosate. They also offer a range of possible solutions to correcting the problem by changing agricultural practices. Glyphosate, known by the name Roundup and other names, is used extensively with genetically modified crops that have been designed to be tolerant of the effect of the herbicide. While weeds evolve a resistance to Roundup in the fields, honey bee pests evolve a resistance to chemicals in the small environment of the bee hive. Beekeepers have seen American foulbrood, a bacterial disease, become resistant to antibiotics. Parasitic Varroa mites rapidly evolved to become resistant to each of the chemical miticides used in the bee hive. Corn, soybean, and cotton farmers are finding it necessary to use different herbicides and mechanical cultivation techniques to control Roundup-resistant weeds. Many beekeepers are moving away from the use of antibiotics and miticides in an effort to keep bees healthy without building strains of resistant pathogens and pests. 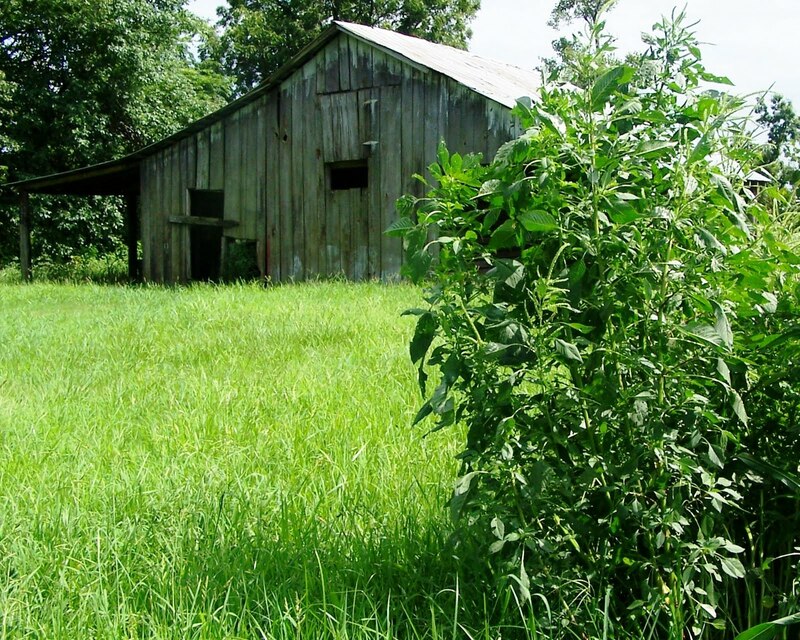 Today’s picture shows Palmer pigweed, one of the six species of Roundup-resistant weeds found in Arkansas. The plant, taller than a person’s head, stands outside a hundred-year-old barn at Peace Bee Farm. I regularly see Palmer pigweed standing above crops in nearby fields. Roundup is a most useful herbicide used by beekeepers to control foliage around bee hive stands. As a test, I sprayed the pigweed by the old barn with Roundup. The tall weed was easily killed by a single spraying at the labeled concentration; it was not resistant. Row-crop farmers and bee farmers should continuously evaluate their Integrated Pest Management approaches. Honey bees propagate their colonies by dividing. Typically, once a year they produce a new queen; and the old queen will fly away in a swarm with more than half of the bees. Swarming reaches its height in the spring. For the beekeeper, the loss of a swarm of bees usually means the loss of that hive’s honey crop for the year. If the beekeeper can catch the swarm, it can make for an additional bee hive. Beekeepers can place bait hives out to provide attractive cavities for swarming honey bees. Not only do they serve to capture one’s own swarms, they also catch passing swarms from feral colonies. 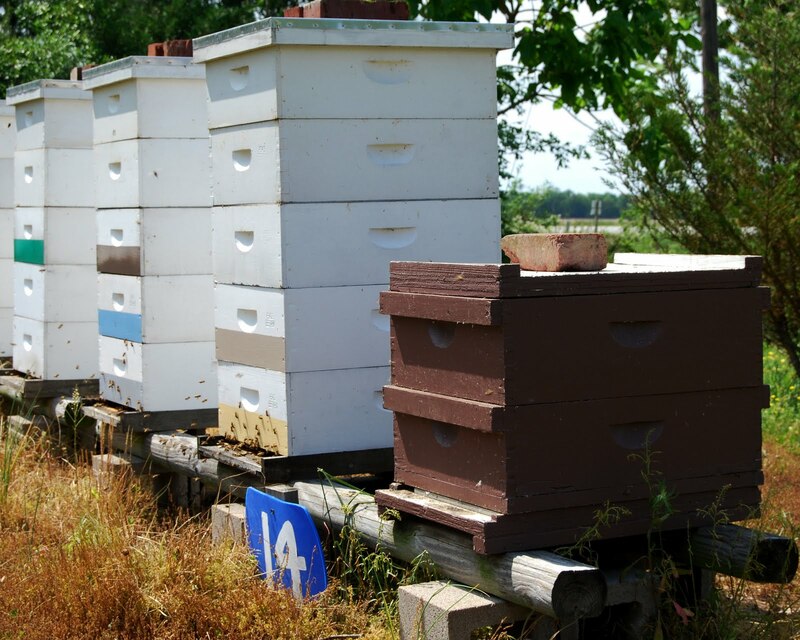 Bait hives can be placed anywhere, but they are most effective if they are located 10 to 15 feet above the ground. One style of commercially-available bait trap resembles a fiber flower pot. It can be baited with a packet of queen pheromones. I have used these traps with some success. If you find the swarm of bees shortly after they moved into the trap, you can pour the bees into a hive. If the bees have been in place for a while, they will have built comb which can be placed into hive frames. We often hear of swarms of bees moving into the walls of houses. After they are removed, it is not uncommon for a new colony to move into the same location if the old comb is not removed. I like to place bait hives which work similarly in my bee yards. These are simply hive bodies holding old comb that I have removed from hives in my comb replacement rotations. The old honeycomb is quite an attractant to the scout bees of swarms. Scout bees can often be found investigating these comb-filled hives soon after they are placed. They fly a rapid zig-zag pattern at the bait hive entrance. In the picture, a brown-colored hive serves as a bait hive in my queen evaluation bee yard. The same elements that make for healthy habitat for honey bees also support a number of other forms of wildlife. All wildlife need food, water, adequate space, and protective cover. We try to provide all of these elements at Peace Bee Farm. We consider the presence of wildlife as a good indicator of the health of the environment. Since birds thrive in the same habitats that support healthy populations of honey bees, we have designated large portions of the farm as a bird sanctuary. The birds and the bees are able to move freely among open agricultural fields, grasslands, forests, lakes, marshes, and swamps. 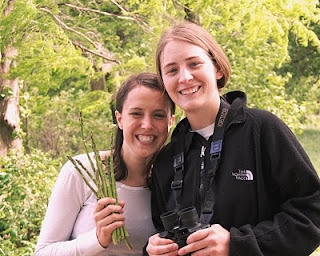 This week we were pleased to have Mary Phillips and her long-time friend from Seattle, Washington, Sarah Pierce, come out to look for songbirds. Sarah, a student of ornithology, attended Warren Wilson College with Mary. They found a number of birds on the farm including blue jays not found around Sarah’s Pacific Northwest home. The blue jay, a member of the American crow family, is making a comeback after its numbers were reduced by West Nile Virus, vectored by mosquitoes. Other bird visitors this week included the colorfully-named bronzed grackle, red-winged blackbird, Eastern bluebird, brown thrasher, great blue heron, and purple martin. More observed visitors were Eurasian ring-necked dove, bob-white quail, Baltimore oriole, Canada goose, mallard, wood duck, and great heron. Cooper’s hawks and sharp-shinned hawks dropped in to steal domestic poultry. Both bird and honey bee sampling projects are measuring the condition of these environmentally-sensitive creatures. Peace Bee Farm is participating in several sampling studies of honey bees. The Great Sunflower Project reminds us that it is now time to plant seeds. Visit http://www.greatsunflower.org/ to participate. This study of the effect of bees on garden plants, crops, and wild plants will be useful; as the bees, plants, and the birds are greatly related in the environment. Sarah was interested in learning that the ivory-billed woodpecker, long thought to be extinct, was found in Arkansas’ Cache River basin.